Greg Laabs, better known to Chatty as OverloadUT, is one of the community's most dedicated Kerbal Space Program players. So there was no better authority to turn to for a guide to game's numerous mods. Those looking to optimize their KSP experience are advised to give it a look. Last week, developer Squad revealed that Kerbal Space Program's owners have downloaded over 1.5 million mods since its Curse mod portal opened back in May. That's a staggering amount of downloads, but one that's hardly surprising to any KSP player. The space exploration game is rich with mods and mod ideas and its Curse page is filled with well over a hundred available items to download. So what are the best mods to help optimize your Kerbal Space Program experience? Fortunately, Shacknews' Chatty community has a resident expert to help provide the answer. Greg Laabs (better known to Chatty as OverloadUT) has spent an ample amount of time with KSP, so much so that Squad even invited him to stream on KSP-TV, the game's official Twitch channel. OverloadUT knows KSP perhaps better than anybody in the Shacknews community and he has offered a helpful guide to mods, which you can check out in its entirety below. So with that, Mr. Laabs, the floor is yours! Definitely the single most popular mod out there. MechJeb gives you the possibility of viewing every parameter of your craft (while building or flying) and your flight at all times. The most important feature is the Delta-V chart, which will tell you exactly how much Delta-V (a measure of how far you can travel in space, more or less) your craft can produce in each stage. The other major category feature of MechJeb is its autopilot capabilities. It can do simple automation such as “keep my ship pointing prograde” to more advanced features like “adjust my thrust so that I a decent at a constant 5 m/s” all the way to full-blown takeoff automation that will take you to orbit with a single press of a button. Many people only use MechJeb for the information features, but a lot of veteran players also find that automating certain repetitive tasks becomes preferable after they have done them by hand hundreds of times. It can also be useful to tell MechJeb to do a particular action just to watch and see how it does it and learn from it. These mods help you interact with the game and its mechanics. Some of them simply provide convenient access to information, and others give you tools for doing things easily that are normally not so convenient. None of them change any mechanics in the game. Kerbal Engineer - Want all of the information that MechJeb provides, but don’t want the autopilot features? That’s basically Kerbal Engineer. It gives you access to every single mathematical calculation and orbital parameter you could possibly need (and more!) Like MechJeb, the single most important information it provides is the ability to see the Delta-V potential of your craft while building it and during flight. ScienceAlert - A super handy button on your interface that lights up when there is science to be gathered. Saves you the trouble of pressing “crew report” every 10 seconds just to see if you have a new report to send. Can also be configured to break out of time warp when new science is available, so you don’t warp right past an opportunity! Kerbal Alarm Clock - Create reminder alarms of important events so that you do not accidentally time warp past them! Final Frontier - Gives your Kerbals ribbons for their personal accomplishments. This really makes your kerbalnauts feel unique, and allows you to keep track of just how many amazing things each little green guy has done. TAC Fuel Balancer - Allows you to move fuel around your vessel in a balanced manner. This is especially important in spaceplanes, where unbalanced fuel can wreck your stability, but is also useful in rockets, where unbalanced fuel in radially mounted tanks cause the things to not fly straight. KSP Alternate Resource Panel - An improved way of looking at all of the resources (fuel, electricity, etc) on your craft. You can see things such as “time until depleted” as well as turn on alarms for when resources are low. These mods change core functionality in the game. From a massive overhaul of the aerodynamics to simulating transmission lag in satellites, these mods will force you to play the game differently. They’re often favored by people who have mastered the core game and want to make the experience more difficult, although other people adopt them earlier simply because they find the heightened realism more fun. Deadly Reentry - The current version of KSP does not care about heat or g-forces. This means that to return home, you can simply drop out of space at any speed and angle, and you’ll be just fine. Deadly Reentry changes that. You better plan your re-entry vector appropriately, and the design of your re-entry craft needs to be able to handle the heat. 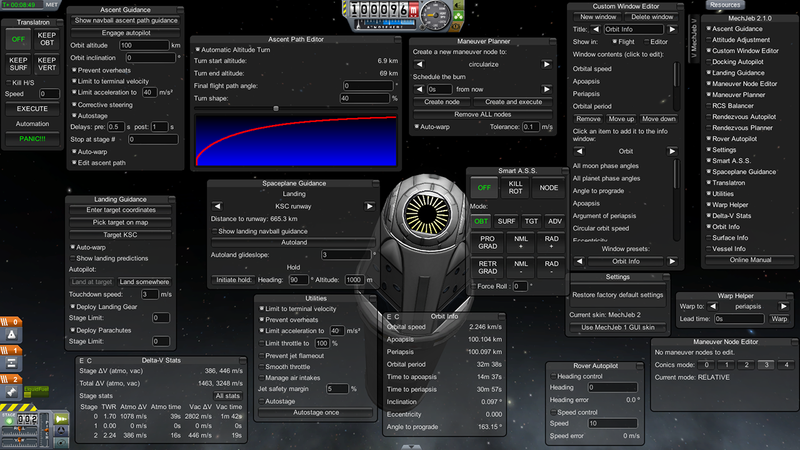 FAR and NEAR - FAR is a massive overhaul of Kerbal’s atmospheric aerodynamics model. KSP’s default aerodynamics are not even close to realistic, to that point that you can literally make a giant metal cube fly. This is mostly unnoticeable when flying rockets (although there are oddities like nosecones providing zero benefit), but can be very noticeable when building planes. FAR replaces the entire aerodyanmics model with a much more realistic one that actually takes into account things like drag, wing surface area, angle of attack and many more things. NEAR is the little brother of FAR, created by the same author. It’s FAR, with just a few of the more hard-to-understand and not-always-fun realism bits removed. RemoteTech 2 - This one is super cool. Unmanned crafts need to be able to communicate all the way back home (or a manned command station you set up) to be able to be controlled. They can do this via a massive network of interconnected satellites. Unmanned craft will also need to deal with a signal delay, which in the far reaches of the Kerbol system can be quite some time. This means you’ll really need to plan your maneuvers in advance, as no “in the moment” emergency adjustments will be possible! Only mod I know of that gives a big reason to launch into geostationary orbit. Real Solar System - Resizes and re-organizes the entire Kerbol System to match our real-life Solar System. Taking off from Earth takes massively more fuel than Kerbal! TAC Life Support - This is one of a few options out there for adding a life support system to Kerbal with food, oxygen, etc. Gotta plan your missions more carefully! RealChute - Changes parachutes to be much more realistic, such as deploying gradually rather than in a bizarre snap. Also provides more parachute options and has features to prevent accidental deployment. Mods in this category are just more parts. There are a TON of part packs out there. Sometimes an author will create them to fill a niche that the stock parts are missing. Sometimes they are creating parts that mimic real-life rocket parts. Sometimes they add minor new functionality. I have the least to say about each of these simply because there’s not often a ton to say about part packs. They add more parts for more build variety! Procedural Fairings - Allows you to create “fairings” which become necessary if you play with FAR, due to drag actually mattering. These ones are procedural, meaning they will size to fit whatever payload you want. Plus, they look super cool when detaching in space. NovaPunch - Just a big ‘ol pack of quality rocket parts with a stock-like theme. Lots of ‘em. FASA - A popular part pack of NASA-inspired rocket parts. Aviation Lights - Gives you little surface-mount lights. The author mainly wanted to be able to add proper red and green lights to airplane wingtips. ScanSAT - Allows you to map planets and moons. You can map their topography, biomes, and even locate anomalies. I really love this primarily because it gives satellites an actual reason to exist, something missing from the base game. It’s satisfying to launch a mapping satellite to a new planet before your manned mission, so that you’ll have a nice map of the topography to find a landing site when you get there. Infernal Robotics - Adds a plethora of moving parts, which allows for a ridiculous amount of creative builds. You get rails that slide, hinges that open, disks that rotate, poles that extend, and more. You can do some pretty crazy and fun builds with this. Pairs very well with KAS above. Kethane and Karbonite - These are two mods that allow you to locate and extract a special material that can be found on every planet which can then be converted into other resources (at the cost of electricity). This allows you to plan for ultra-long missions that bring along a drill that lands on each planet’s surface to refuel before heading to the next stop. Kethane is the original and most popular, while Karbonite is a recently-released up-and-comer, meant as an alternative for those that prefer more permissive licences in their mods. 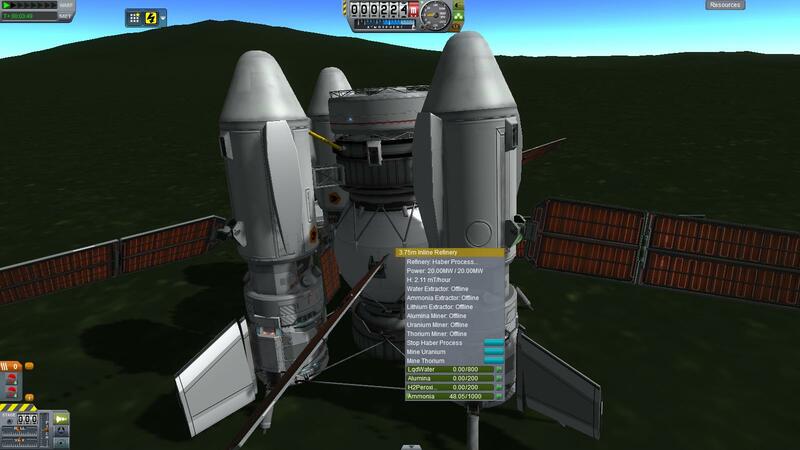 These mods mainly focus around extending the endgame of Kerbal. They give you things to do once you’ve done everything else, or if you’re just looking for a new challenge to conquer. KSP Interstellar - The most popular “future tech” mod. Provides a whole bunch of more advanced technology to unlock and master, including the biggest and baddest part: the warp drive. It’s implemented in a way that feels balanced and still requires you to engage in very careful maneuver planning to use properly. Near Future Technologies - Another popular and polished future tech mod. The author’s rule for this one is all of the technology in this mod must have been demonstrated in real life to be possible, even if we haven’t done anything useful with it yet. USI Kolonization Systems - Adds a bunch of parts and systems that enable you to build bases on other planets that are more than just a bunch of docked landed ships. Extraplanetary Launchpads - Allows you to build space factories so that you can build ships in space! But you’re going to need to lug up the raw materials and fuel first! I couldn’t fit these nicely in to one of the other categories, but I think they’re fantastic enough to get individual mentions! Fine Print - Greatly expands the brand new Contracts system to provide much greater variety in the contracts you get offered. 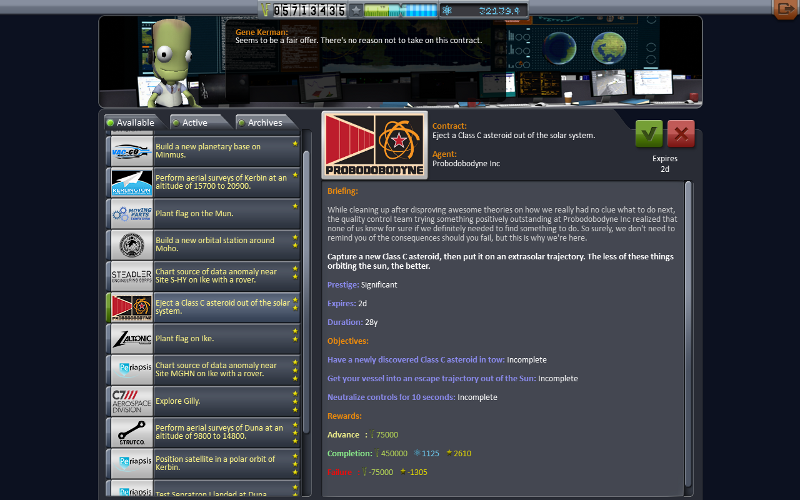 Adds contracts to build space stations, use rovers, deal with asteroids and so much more. RasterPropMonitor - This one is a little weird because it’s mainly meant as a framework to allow other mod authors to make cool pods. It adds HUGE potential functionality to cockpit view, not the least of which is adding realistic computers inside the pods you can interact with it. However, it does also add these things to the default KSP pods, so you can still get a lot of fun out of it even if you don’t use a mod pod that takes advantage of it. A special thanks to OverloadUT for providing this vital information for KSP newcomers and enthusiasts alike. 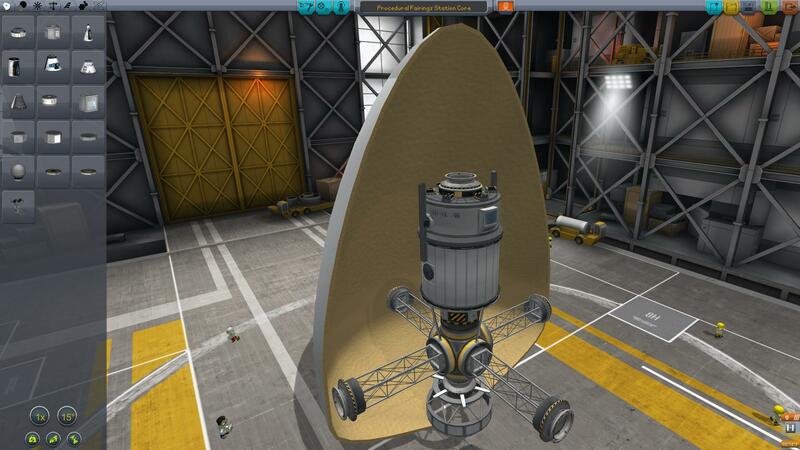 Kerbal Space Program is available now on Steam Early Access. 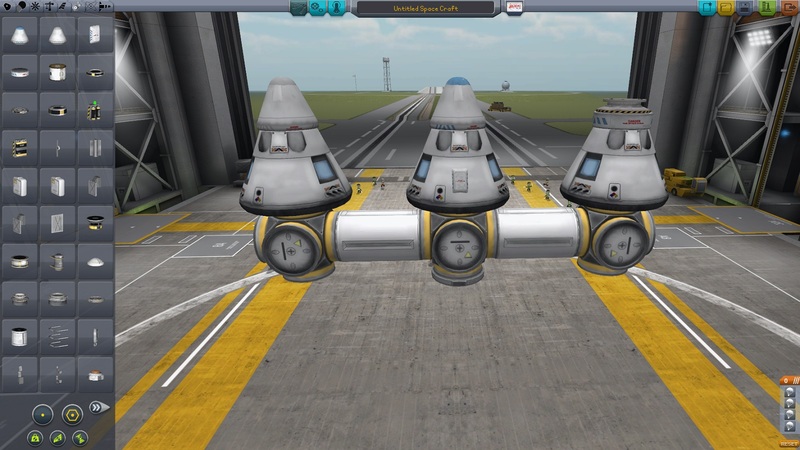 Ozzie Mejia posted a new article, Community Spotlight: OverloadUT's guide to Kerbal Space Program mods. That would be like a magician explaining his most impressive illusion!! So which, if any, should you start with if you've never kerballed before? If you haven't played at all don't install any mods. Get a feel for it first and you'll have a better understanding of which will be most useful to you. None. Land on the mun on your own first then start looking at mods. That way you end up having a good grasp on all the mechanics involved while having the glorious mishaps that little kerbals love so much. ^^^ Yep, this. Start with just the base game. Once you get to a point where you are thinking "I really wish I could tell THIS about my craft" or "I really wish there was a part that did THAT" or any other sort of thought like that, then start thinking about mods. Hey, no fair! Why does OverloadUT get one? I have lots of knowledge about lawn mowers! Am I in for a hell of a ride? Wait until I tell you about the alternate uses for the oil! Does it come from bacon? Ooh... That would be better. I was using squid fat. I keep meaning to try out this game. Nice write up OverloadUT! not shown: the mod that makes me a GOD, whatever it is. You don't need a mod for that, bro. You never have.